All of our Kid's instructors have children in the program and are dedicated to creating a safe family environment where our kid's can gain the many benefits of training in Jiu-Jitsu. 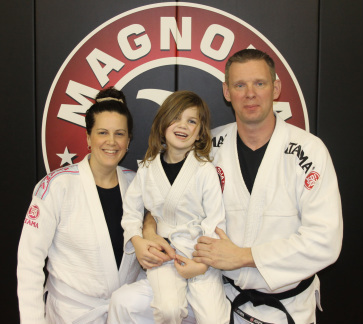 Scott and Carina are the owner's of Magnolia Brazilian Jiu-Jitsu. They have four small children, the oldest of which, Maddie and Anna Beth, are enrolled in the Kid's Jiu-Jitsu Program. Doug and his family of Judo instructors, Starla, Scotlan, Skylar and Sterling, run the kid's Judo program. Doug is a great ambassador of Judo and has helped us grow and strengthen our Judo program. Starla, Scotlan, Schylar and Sterling all have great technique and are very patient when working with the beginner students.